The former Rangers defender is accused of driving dangerously through Fife. 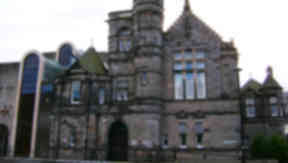 Mohsni was due at Kirkcaldy Sheriff Court. An arrest warrant has been issued after former Rangers defender Bilel Mohsni failed to turn up at court to face a dangerous driving charge. The French-born Tunisian centre-back was on a short-term contract at Championship side Dundee United when he allegedly committed the offence on April 8 last year in north east Fife. Moshni, 31, was due at Kirkcaldy Sheriff Court on Thursday, but failed to show. Fiscal depute Catherine Fraser told the court: "The complaint has been sent out to the address he was living at at the time. "Although he has a limited record he does have previous convictions for road traffic matters. "He is obviously aware there is a case on going." Sheriff James Macdonald issued a warrant for Mohsni's arrest on the basis that his present whereabouts are unknown. Prosecutors allege Mohsni drove dangerously, repeatedly overtook several vehicles when it was unsafe to do so and crossed a solid white line during the incident last April. The incident is alleged to have happened on the A914 between the Forgan roundabout and St Michaels.